Riding on East Side Beach, Grand Turk. The beach where much of this ride takes place on isn’t exceptional due to the typically large amounts of washed-up seaweed, but otherwise this riding experience is great. Suitable for nearly all ages and skill levels. The view from the bluffs of Grand Turk. Grand Turk is a great destination for water sports, and riding here brings a bit of the ocean element to what’s traditionally thought of as a land sport! There are two fun options for riding on Grand Turk; the Ride N Swim with Chukka Tours, and Sunset Rides and Tours. 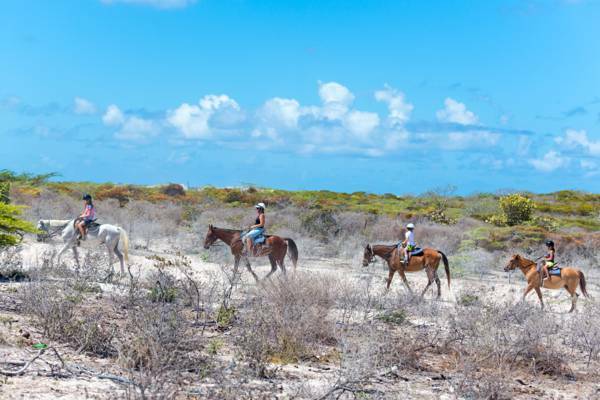 Each of these stables are located on opposite sides of Grand Turk, and each tour offers different terrains and beaches to explore. Most rides include the option of wading in our crystal-clear ocean water. The greatest factor when deciding between the two businesses is the environment and landscapes you’d like to ride in. If the beach is the primary focus, Sunset Rides is the better option. If you’d also like to also see the lighthouse and wetlands in addition to a decent beach, choose Chukka Tours. Prices start at about $70 per person for children and $85 per person for adults. Tours may be booked through your cruise line as a “shore excursion”, or privately on your own. When booking, be sure to confirm the time and which vessel you’re arriving on. Chukka Tours operates an expansive stable at the north-eastern end of the island at East Side Beach, not far from the Grand Turk Lighthouse and the abandoned US Navy’s NAVFAC 104 base. The riding route here typically begins by climbing the east coast bluffs and descending to mouth of North Creek, where sheltered wetlands and the country’s only lighthouse can be seen. The ride then returns to the beach. Riders may wade into the ocean if they choose. Certified guides lead all excursions. One of Grand Turk's ponies. The terrain travelled through the trail is quite interesting. Exposed to the constant eastern trade winds, low drought and wind resistant vegetation has become established. The area is likewise fascinating from a geomorphological perspective. Sand, largely originating from marine shell and coral animals, forms a high dune ridge over much of the eastern side of Grand Turk. This ancient dune, piled by wind and wave action, isn’t quite as lithified as the limestone in the Caicos Islands, and is consequently soft and crumbling. 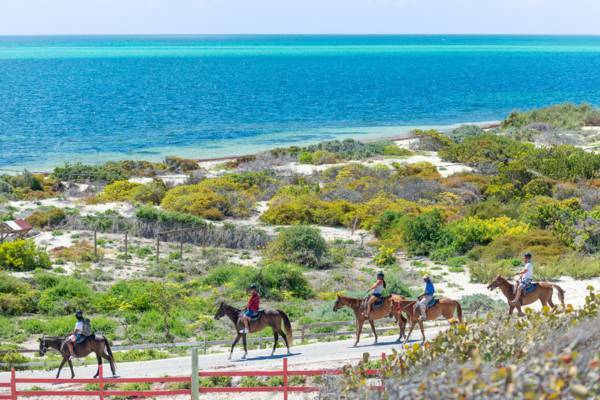 This new riding stable is located on the southern side of Cockburn Town, and closer to the Grand Turk cruise port. Guided beach rides on English Point Beach and Governor's Beach (the best beach on the island) are offered as well as an inland adventure near the relatively undeveloped regions of South Creek and Hawkes Nest. In contrast to the Chukka Tours route, you’ll see more of the town, salt salinas and a better beach with this stable. Minimum rider age of six years. Tours range from 1.5 to 2.5 hours. Tours are not suitable for those who may be pregnant or have back injuries. As is also the case with the stables on the island of Providenciales, small and hardy island ponies are used. Because of this, there is a weight limit of 220 pounds per rider per horse. Helmets are available for children and those who request them. Crossing the bluff to North Creek. 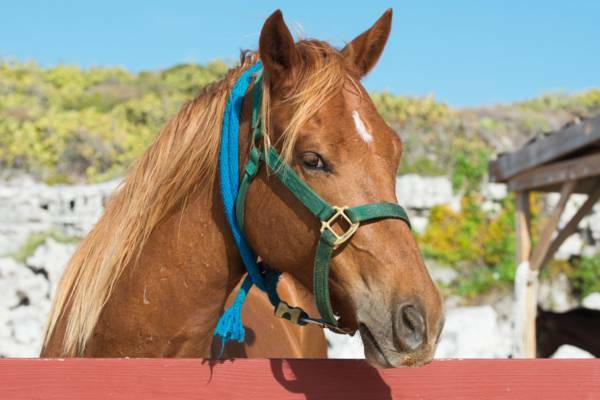 Transport from the Grand Turk Cruise Center is included with all horseback riding tours, and the local businesses will work with the cruise ship schedules. If you have a rental car, it’s possible to make your own way to the stable, yet for most they will likely be difficult to find. We advise consulting the map and having a phone, so you’ll able to call if necessary. Recommended riding apparel differs according to whether you’d like to wade in the ocean or not. On land, it’s best to go with long pants and closed shoes. If you expect to ride in the ocean, flip-flops and long pants that won’t get bogged down with water are preferable. Due to our intense sun, hats, sunglasses, and sun screen are recommended as well. To avoid sunburn, long sleeves rash guard or synthetic shirts are also a good choice. A compact camera may be brought, yet we advise against larger types. Be aware of the risk for damage by water or falls. 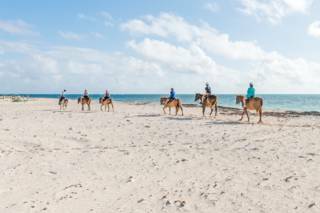 Chukka Caribbean's Horseback Ride and Swim visits North Creek and East Side Beach. Prepare to get wet (for those who want to!) with a ride in the ocean!